It’s Miyazaki Monday once again! And once again, I’m going to rave profusely about the awesomeness of a Ghibli film. I promise, there will be at least one decidedly negative review at some point (*ahem, Pom Poko*), but that’s still a few weeks off. 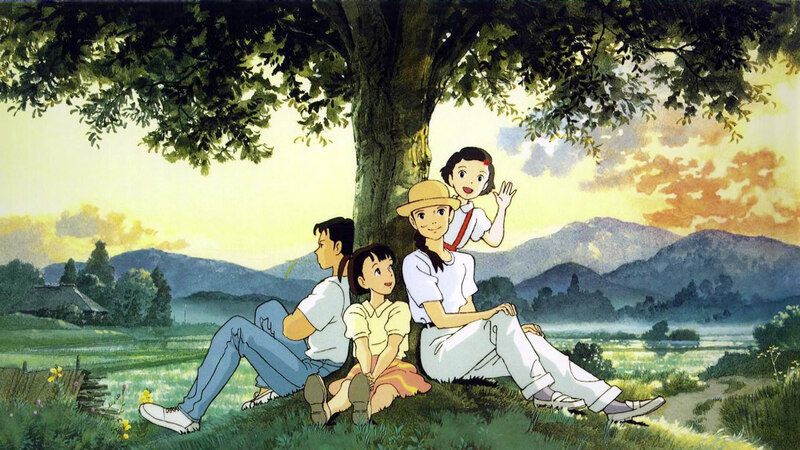 Only Yesterday is the second Ghibli film not directed by Hayao Miyazaki. Rather, here we have another insightful, quiet slice-of-life film from Isao Takahata (director of Grave of the Fireflies … and, unfortunately, inexplicably, Pom Poko … but, as I said, we’ll get to that in a later week). I believe I claimed that Grave of the Fireflies was the only Ghibli film not to be released by Disney in the US, but I was mistaken. Disney at first planned to release Only Yesterday, but refused to do so after Ghibli prohibited them from editing out all references to menstruation from the film. (Haha, and yeah, there are quite a few of them … I’ll explain soon.) So, not only was there no Disney release for this film, but as far as I can tell, it hasn’t even ever been dubbed in English! So, this is the first Miyazaki Monday on which I watched a Ghibli film in Japanese with English subtitles instead. While I’m not bothered by American voice acting, and (unlike most anime enthusiasts) even prefer dubs in general, it is refreshing every now and then to sit back and delight in the cadence of the Japanese language. And, really, Only Yesterday is such a thoroughly Japanese film that it seems quite appropriate to have done so. The music, by Katsu Hoshi, is lovely and suits the film quite nicely. I’m not certain if Hoshi is also responsible for the Hungarian folk/farming songs that provide the backdrop for most of the film, though. And those are the musical moments that create in this little movie some of its most powerful scenes. The animation style is different — somewhat looser, mistier, dreamlike and dated — than much of Ghibli’s work, though the style is indicative of Takahata’s presence, and it encompasses the viewer cozily in the fuzzy cloud of nostalgia and reminiscence within which the story develops. The story is told by a 27 year old Tokyo office worker, who is going to the country for her holiday from work. As she travels towards the fields of safflower, the rice paddies, and the orchards where she’ll work throughout the next ten days, she is accompanied by the constant memory of her 5th grade year and her 10-year-old self. We return with her to childish moments of selfishness and covetousness, to the awkwardness of school children’s mockeries and the girls-only mandatory lecture from the school nurse (hence the references to menstruation), to arguments with siblings and punishments from parents, and to the realization that who she has been is still shaping who she will become. All the while, we see her as a 27 year old, fulfilling her childhood desire for a visit to the country, and finding there a freedom, satisfaction, and delight in a type of hard work unlike anything afforded by Tokyo’s offices. Hers is a story of coming of age, and also a story of redemption. But these are not dramatic events played out in some climactic tale … rather, they are honest musings, utterly relatable, slow and thoughtful and simple. I don’t know quite how to describe any better what the film is or what it does, or why I feel so incredibly affected by it each time I watch it. I just know it’s good. 🙂 It wanders almost into the category of chick flick, which for me is almost instantly distasteful in any film — but there are a handful (a very, very select handful, mind you) of chick flicks that I also believe are truly great films, and Only Yesterday happens to be one of them. Also, hey, that surprising song over the end credits cracks me up *every time*! Nothing like sappy American love songs sung by Japanese vocalists. Too funny. Pros: Great music, powerful portrayal of the beauty and providence of nature, interesting exploration of life and desire and genuine happiness, lovely animation, etc.